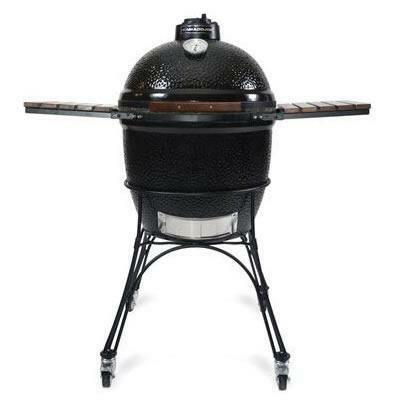 The Kamado Joe standard configuration Includes a powder coated cast iron cart with locking casters, and finished bamboo side shelves. The black grill has "teak finished" bamboo, and the red grill comes with "natural finished" bamboo. A stand alone configuration is also available for intended use in grill tables and outdoor kitchens. This stand alone version is available with either black powder coated galvanized steel or stainless steel bands and hinge for a sleek appearance. Cook on multiple levels on multiple surfaces at once! Twice the overall cooking surface. Multi-level cooking (sear a steak and grill veggies at the same time. Create different heat zones. Specialty surfaces also available. 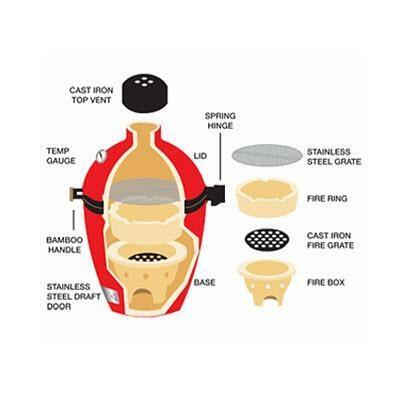 Additional Information Cooking Surface 18" Diameter, 256 square inches (650 square centimeters)w/Grill Expander 407 square inches (1,034 square centimeters); Heat Range 225°F – 750°F+ (82°C – 399°C); Base/Lid High Fire Heat-Resistant Ceramics; Glaze Heat-Resistant Ceramic Coating; Top Vent Powder Coated Cast Iron; Cooking Grate 304 Grade Stainless Steel; Fire Box/Fire Ring High Fire Heat-Resistant Ceramics; Fire Grate Powder Coated Cast Iron; Cart Powder Coated Cast Iron. Warranty Twenty (20) years for all ceramic parts (dome, base, firebox and fire ring). Five (5) years for all metal parts (excluding cast-iron parts). One (1) year for all cast-iron parts (top vent or lid and fire grate). Thirty (30) days on thermometers and felt gaskets.